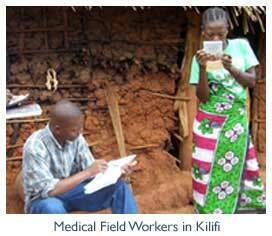 For over a decade, dozens of medical field workers have been surveying the 200,000 inhabitants of the Kilifi District on the coast of Kenya, an area where the endemic rates of malaria are higher than anywhere else on Earth. These medical field workers typically start their mornings at the Kilifi local hospital where they receive a print-out from a database detailing the names and locations of the people needed for their day’s survey. After a long journey consisting at times of several hours, the medical field workers locate the appropriate people, obtain reposes to their survey, and try to make it back to the hospital with the resulting data before nightfall. The Mobile Demographic Surveillance System (MDSS) is an attempt to enable these medical field workers to conduct these surveys on mobile phones that can remotely interface with local hospital’s database. Shifting the system from paper-based surveys to mobile phones has the potential to allow the field workers to remain in the field for longer periods of time while bypassing the time consuming and potentially error-prone data transcription process. This survey data has also been attempted to be collected with PDAs which can have a similar ability to record the time and location where each response was recorded. However, not only were the PDAs unable to connect to the hospital database directly from the field, data entry on mobile phones has been found to be more intuitive to the field workers simply because of their familiarity with text messaging. The MDSS mobile phone software was written by John Muli, Geoffrey Muthondu, and George Njuguna, undergraduate students at the University of Nairobi. The system was implemented using Python for Series 60, which provided access to cell-tower information as well as GPRS functionality. An article on the MDSS was published in the May 2007 edition of New Horizons. To further our understanding of the underlying factors driving entrepreneurship using mobile phones, we are involving several students as research assistants to pursue research on behavioral and mobile phone usage patterns. We will be distributing Nokia ‘smartphones’ to fifty individuals in different demographics and log their behavior over the course of six months. The phones will have a custom application that continuously logs location, nearby peers, communication and phone usage statistics, similar to the data collected for 100 people during the Reality Mining project at MIT. In this previous research, we generated models of our subjects’ lives with such precision that they could be used to accurately predict subsequent behavior. Based solely on data logged by the phones, we have successfully shown that after two months logging it is possible not only to predict behavior, but also to infer friendships, differentiate demographics, validate survey responses, and even quantify the dynamics of an organization. It is our hope that this data will provide an analogous quantitative description of Kenyan social networks and mobile phone usage behaviors. Dennis Muchiri, a fourth-year computer science student at the University of Nairobi is building a neural network that takes this behavioral data collected from the mobile phones in Kenya as input and computes a unique signature for each individual’s behavior. The neural network is used to identify lost or stolen phones by detecting if a user deviates significantly from previous behavior. In Kenya, blood allocated for transfusions is stored in several centralized blood banks throughout the country. The job of a central blood repository is to ensure the dozens of neighboring local district hospitals are always stocked with an adequate amount of blood to meet the transfusion needs in the event of an emergency. However, most of these local district hospitals lack reliable electricity and phone lines. Without a consistent method of communicating with the local district hospitals, the central repositories are unable to stay updated about where blood is most needed. BloodBank SMS was developed by University of Nairobi student Eric Magutu to improve the communication between local district hospitals and Kenya’s centralized blood banks. The system enables medical workers at the local district hospitals to provide information about their remaining blood stock directly to their centralized blood bank. Medical workers from each district hospital can simply send a free text message to the service detailing the amounts of each blood type remaining. Real-time blood levels for each local hospital are graphically displayed on a web-based interface designed for administrators at the central blood repositories. Additionally, should the blood levels at a local hospital get below a critical threshold, the system automatically sends SMS alerts to the appropriate individuals at the centralized blood bank. It is possible to purchase an unlocked GSM mobile phone in Kenya for less than $15. However while these inexpensive phones dominate the African market, they are typically older, refurbished models, unable to run the Python and Java applications developed by many of our students. However, there are universal applications that can be run on even the oldest GSM phones – these applications are designed to be run directly from the phone’s sim card. Ernest Ngaruiya, a Kenyan MIT undergraduate, is developing applications that can programmed into virtually any GSM sim card. Not only can these applications run on every phone in Kenya, but they are installed by the mobile operator over-the-air. This means that with operator collaboration, our sim-based applications can be installed on the phones of all 8 million Kenyan mobile phone subscribers virtually overnight.